My daughter is visiting this week, and I asked her if she would be willing to give me some ideas on what to do to my sewing room so it would be organized and cleaned up a bit better. Then I asked her if she would be willing to help me with some of her ideas. I honestly feel like I've been on an HGTV makeover. We took down a small table that I had at the end of the table with the blue cutting mat to the left. I tend to "fill up" any horizontal surface I have, so it was just used to stack things. We moved my bookshelf over a bit so it is easier to get into the closet, and the drawer units that were on that wall are now underneath the cutting table. Each drawer in the two drawer units to the left of the cutting table holds a project that I have started. The drawers under the cutting table hold strips that are 1", 1 1/2", 2 1/2" and 5". I have projects I've started in the basket and tins on top of the drawer units. All of my fabric has been moved out of this room to a closet in the loft area. There is a skylight there which makes the area bright even on a cloudy day, and it is really nice for pulling fabrics. We had a busy but very productive day, and I am really happy with the results. On the sewing front, this is what I've been working on. I've been in a crochet mood lately. I started over and made the afghan more narrow so it would end up more the size that could be used on a twin bed. It took awhile to unwind the yarn from the longer afghan, but I really like the finished afghan. I love the pink and brown variegated yarn in this afghan. All of this yarn came from my stash. I also made this little baby blanket from yarn that I had in my stash. I hope you are all finding some time to do some stitching! Thanks for stopping by for a visit today. Here's a second photo so you can hopefully see everyone. Today is the patriotic concert at Irvington United Methodist Church. 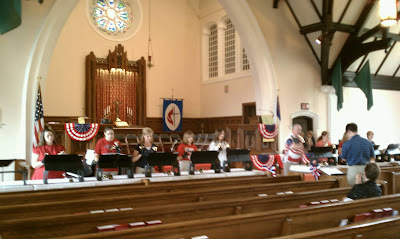 Thus is the handbell group. 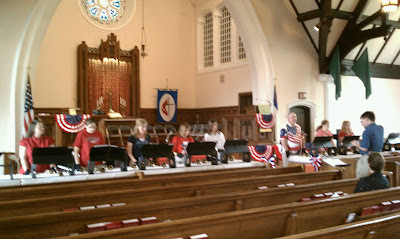 My son is director, and my daughter is second from the right and daughter-in-law is second from left. Me? I'm in the choir with the rest of them. This is a fun performance that we look forward to every year. When my Mom was still living I would call her almost every day to check on her and see if she needed anything. I would ask her what she was doing, and she would say, "Oh, I'm just puttering around." I never quite knew what she was really doing, but now I think I do because.......I've been puttering around. I've been working on a round robin that I'm in, but I can't show you the quilt I have because our group keeps it all secret until we reveal and give our quilts back to their owner at our Dear Jane quilt retreat in November. I had a hard time finding Patriotic fabric last week to do the pillowcases from my last blog post, so I bought plenty so I could have some to do a few blocks for the Quilts of Valor Heartstrings project. You can visit Mary's blog to see some of the quilts that she has quilted. They are just gorgeous. I've also found a Facebook page for a Quilts of Valor group right here in Indiana. I've been making some 2" finished half square triangles. Here is part of another scrap quilt I've been working on. Our quilt guild needs 80 preemie quilts every month to supply two hospitals with needed quilts. Guild members help to provide these quilts. The basic size requested is 16" X 16" or somewhere close to that. These quilts can't be too heavy so just a cotton top with a soft flannel backing is fine. They can be either finished envelope style or have traditional binding. The guild even says this is a good time to practice your machine quilting...I'll be making more of these so I can keep practicing. Here is one that I've been working on. I just need to hand sew the binding. This started out as a split 4 patch that went wrong, but I know that a tiny baby and Mother will love it just the same. I hope you are all finding some time to stitch today. Thanks for stopping by for a visit! Press the 2" trim piece in half with wrong sides together. Lay the 9" cuff piece right side up on your cutting mat or a table. Next lay the 2" trim piece on top of it matching raw edges. Put the main pillowcase fabric on top of all of this face down. Match only one raw edge and pin together. Now roll your pillowcase fabric up toward the top where you have pinned. Next pull the bottom of the cuff up over this rolled up pillowcase fabric and pin the raw edge to the other raw edges. Some people call this a "hot dog pillowcase" because it looks like a hot dog rolled up in a bun. Sew along the pinned edge. Now reach inside of the tube and pull the main pillowcase fabric out. It is a bit tight, but just whenever you think it will never come out of that tube, it slides right out. I like this pattern because by sewing the pillowcase this way the raw edges of the cuff and trim piece are all enclosed and by top stitching, the raw edges inside are also enclosed to give the pillowcase a more finished look. I hope you are all finding some time to stitch today....and maybe even to make a pillowcase. I've been sorting through my scraps, slicing up fabric, and feeding my scrap bins and my containers that hold my scrap quilts. These scrappy blocks are on my design wall, so I decided to make a few more today and add to them. These blocks are from an Edyta Sitar pattern. Each block will finish at 3" so I'll be able to use a lot of scraps in this one. The white in the blocks is not supposed to be so prominent as to create a secondary design so I either sort out the lights that are reading too white and move these blocks around, or I give them a little tea bath. Tomorrow is more slicing to feed my scrap projects and cutting for a new project. I know I have more UFOs than I can count, but this one is just something that I can't resist. More on that one later. 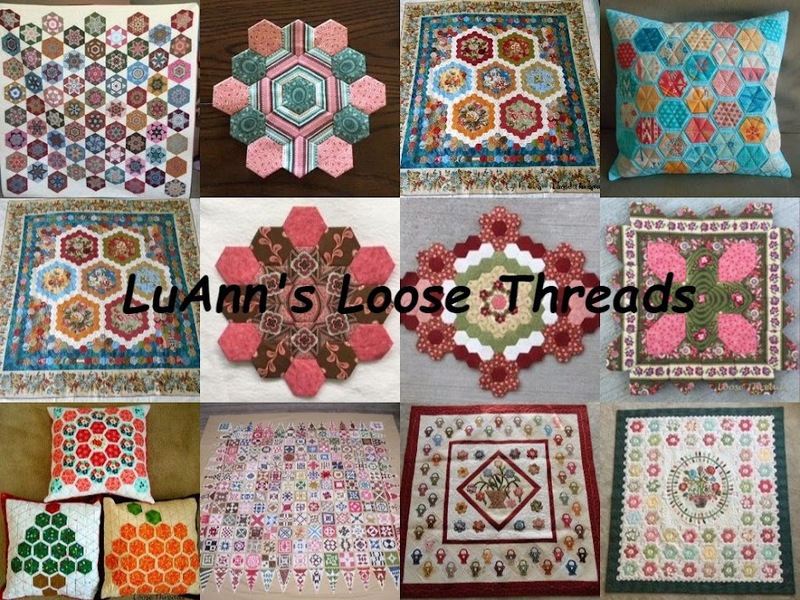 Thanks to Judy at www.patchworktimes.com for hosting Design Wall Monday. I hope you are all finding some time to stitch. Thanks for visiting. Today I finished a couple more hexagons for One Flower Wednesday. I've fallen behind the last couple of weeks, but I plan to try and do a couple of flowers each week. This is really a great way to end up with enough for a quilt. Thanks to Karen at Journey of a Quilter for hosting One Flower Wednesday. I love to sit out back on the deck and stitch and watch the birds and just listen to the noises in the woods. I am really enjoying all of the yellow day lillies (Stella De Oro variety) that are blooming this year. I had forgotten that we divided some of the larger plants last year. They are perennials and take almost no care. This photo really doesn't do them justice. These are way out back in the far corner of the yard. When I opened my little zipper bag to work on my hexagons, I found a nice surprise. I had forgotten that I got this little needle case when I stopped in the Moda Bake Shop booth at the quilt show in Paducah. When I saw the Moda Bake Shop sign there, I had my hand already on my credit card to get it warmed up....but they were just there to make sure we were aware of the web site and the free patterns, etc. They gave us this as a little gift for stopping by their booth. Thanks for stopping by today. I hope you are finding some time to do a bit of stitching. Thanks to all of you who entered my giveaway. I hope you have been finding some time to stitch today. Thanks for visiting. There hasn't been much sewing done here since I started cleaning, sorting, and rearranging so I thought I would have a giveaway. Today's high temperature was 96 degrees F (around 35 C). It is still a little over two weeks until the official start of summer, so it only makes sense to have a summertime Christmas giveaway, right? The giveaway includes this fabric from the line Christmas Presence by April Cornell for Moda. There is approximately 1/4 yard each of the red and green texture and the red floral, 3/4 yard green floral, 1 yard white floral, and 1 1/2 yards of the border print. 1. Just leave a comment and tell me where you are from and your favorite thing to do in the summer. 2. Make sure that I have a way to contact you. If you are set as a no reply blogger, make sure you leave me your email address so I can contact you. That's it! The giveaway will end Tuesday morning, and I will send the winner an email then. I hope you are finding some time to stitch today! This morning I decided that I should organize my sewing room. Things are just too chaotic for me to function in there and there are piles everywhere so I'm sorting everything into cardboard boxes and shopping bags to get it all organized. Then I'll put it all back in different drawers. I rearrange my fabric every once in awhile just to get a look at what's really there. And I did pretty well until I got all of the Kaffe fabric into one box and then sat down and took every piece out again to "pull fabrics for a couple of quilts" I'd like to do someday. That was my "all work and no play" moment. So tomorrow I've got to put all the Kaffe back in the box before I start sorting again. I'm going to show you a before picture in hopes that before long I can post the after picture. Before I started to tackle that mess I put dinner in the crock pot. The ingredients are pretty simple. I served this with a little salad and a glass of fresh brewed iced tea. And what did I find in my girl cave? This is a Four Plus One Equals Fun pattern by Lori Smith. If I finish this I'm going to have to pull up the leaves and the pink flowers and put the stems underneath. This must have been before Applique' 101. I talked a bit with Lori Smith in her booth in Paducah, and she is really a nice lady. This is from a 2005 McCalls magazine. This is a Barb Adams/Alma Allen pattern done in one of their fabric lines called Rhubarb and Ginger. I loved that fabric and used it and shared it until all I have left is some of the large floral. I'm not sure what is going on with this applique'. The shapes are pretty odd looking...like the purple square over on the right. I think maybe I just stuck some of the fabrics on with glue to audition them????? And, these red and green kits don't really look familiar. They are from Quilts Plus, one of my local quilt shops - 2007. It looks like I have enough kits for 7 blocks so I can either do a small wall hanging or make two of each block for a larger quilt. I hope I don't wake up in the morning and find the Hoarders truck sitting in my driveway. I hope you are doing some stitching today, and I hope that I can get back to my sewing machine and work on a project soon.